If there was ever any doubt as to whom President Obama has his allegiance to there is none now. He had the audacity to downplay the barbarism and violence of The Islamic State of Islam or ISIS and other Islamic terrorists at the National Day of Prayer breakfast. Our “one nation under God” that this country was founded on was not the God Allah, but the God Yaweh- the Judeo-Christian God. At the prayer breakfast this God and his followers were defamed and ridiculed by comparing the Historical violence of Christianity to the present atrocities of the followers of Allah. Obama has a very dim understanding of history, because both the Spanish Inquisition and the Crusades were in retaliation to the violence and invasion of the Islamic Jihad during the 1500’s. To compare Christ who murdered no one to Mohammed who murdered innocents is also a misinterpretation of history . The question might be what is the motivation behind Mr. Obama’s statements? Is it to justify his lack of concerted effort against ISIS? Is it some kind of reprimand against Christians for disagreeing with his policies on marriage, and Obamacare’s forcing organizations to provide abortions for their employees? Steven Crowder called it “evil” to make this kind of accusation against Christians. 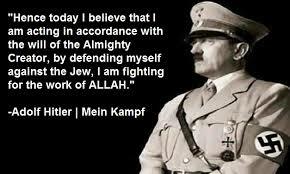 This made me reflect on one of the most evil rulers in history- Adolph Hitler. I found that in his speeches, he blamed past wars and the historical so called “evils” of the Jewish people as a justification for the Holocaust . Was the President blaming Christians for the murders committed by ISIS and other Islamic terrorists? Is he setting up the American people for an American Jihad against them? The anti-discrimination laws are already putting Christians at risk of incarceration as I mentioned in my last blog. The question is-will non-Christian Americans believe the rhetoric the way non-Jewish Germans did in 1941 and allow it to happen? The Bible promises that “pride goeth before a fall”. The pride of this man far outweighs that of any other Commander in Chief in the history of the United States. His executive orders have made him more of a monarch than a president. The monarchs of England who took the kind liberties that Obama has taken were soon out of power. How far will we let his abuses go as a nation?